Enjoy online games in a different and unique way! Have you ever tried to fool your online game friends in online chat by changing your voice into freaky girls or silly boys, or even creepy aliens? Or do you need a "crazily fresh" gaming air? Voice Changer for online game can bring you some! 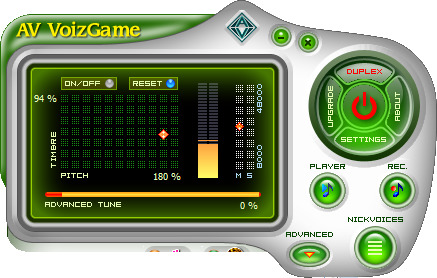 AV VoizGame is an Online Voice Changer specializes in voice manipulation in online game community. The Virtual Audio Driver mode of this program gives the ability to disguise your real voice while speaking through a microphone in real-time. With the help of the timbre and pitch graph in this program, you can turn into a completely anonymous person by modifying your voice. You can also take advantage of its fabulous ready-to-use voice output (aka nickvoice) to grant a quick access to a certain character's voice. 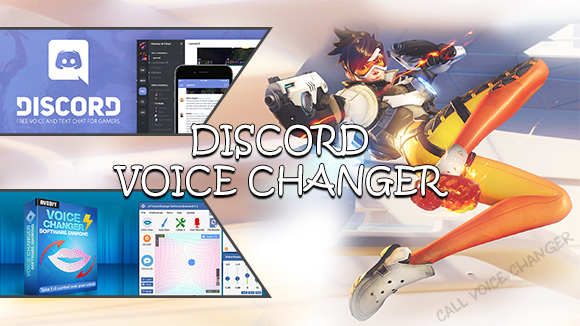 As soon as you click on a nickvoice, all related effects will be automatically applied on morpher graph which helps you save lots of time while joining online game community. Now, you can start confusing the hell out of your online buddies or opponents by being a brave hero, unbeatable warrior, weirdest monster or a chic princess ever. AV VoizGame is compatible with most chat application such as Ventrilo, Teamspeak, Roger Wilco, Yahoo Messenger, MSN, etc., and famous online games from World of Warcraft, MU to Counter Strike and EVE. Besides that, this masterpiece doesn't take up much space on your PC and you can make its skin transparent for more convenient use and internet surfing. Cool huh?! Then, hurry up and start your coolest jokes in online chat rooms using this brilliant online voice changer.